4. 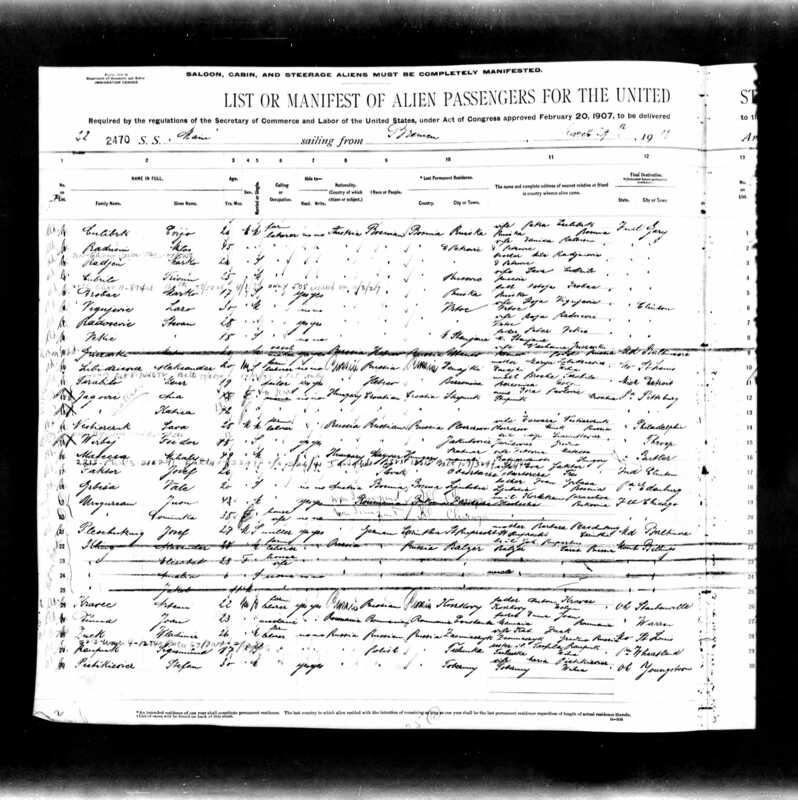 Immigration, 14 Apr 1913, Baltimore, Maryland, United States. 8067 Sigismund Raupuk is included in the passenger list for S.S. Maine sailing from Bremen to Baltimore on 29 March 1913, arriving 14 April 1913. He is age 17 [although Ancestry index transcribes this as 37], single, laborer, cannot read or write, citizen of Russia, race or people Polish, permanent residence Tulunka? Russia, nearest relative in home country sister-in-law Teafila? Raupuk, in Tulunka?, Wilna, final destination Wheatland PA, passage paid by self, in possession of less than $50 [cannot read how much, might be $5], never been to US before, going to join brother John Raupuck at Box 129 Wheatland PA, 5'7", fair complexion, blde hair, grey eyes, no identifying marks, born Tulunka? Russia. 5. Story. Note I sent to Nancy O'Neill on 8/25/08 (discussing ship passenger list records for Sigismund Raupuk in 1913 and Francesik Raupuk in 1910: I think the 1910 and 1913 Raupuks are likely brothers too, because they are close in age, are both from the same town, and both say their destination is Wheatland PA. If they are brothers, and the Sigismund Raupuk is your grandfather, then we also know your great-grandfather's name, since the 1910 entry specifies the nearest relative as his father and provides a name (although it's hard to read). The 1913 entry says the nearest relative is a sister-in-law, implying that the father is now dead (or they aren't really brothers). It's interesting trying to track your grandfather from state to state. Based on these records, he arrives in Baltimore in 1913 but says he is headed to Pennsylvania. Maybe he really goes there, because later on in his 1930 Census record he says he received his citizenship in Pennsylvania [that was an incorrect reading of the Census record on my part. The Census really says his citizenship is "Pa", meaning the paperwork is pending, not that it was granted in Pennsylvania]. Unfortunately, he also says he became a citizen in 1912, which can't be right if he didn't arrive in the country until 1913. I haven't found any records showing him in Pennsylvania yet, but now that we know he might have gone to Wheatland, it might be easier to find him there. By 1917 he is living in Bayonne NJ (and claiming to be an alien, so in that record he says he isn't a citizen yet). He is still there in 1921, because your uncle Albert is born there. 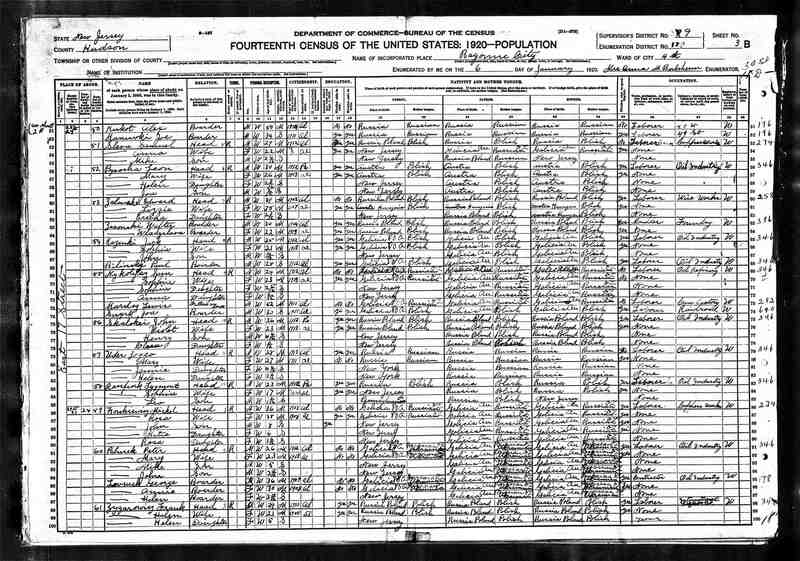 That means there should be a 1920 census record for him in NJ, but I haven't been able to find it yet [I found this census record later]. By 1922 he is in Baltimore, because your dad is born there. From that point on he seems to stay in Baltimore. 6. Story, 1915. In 1915 Jersey City & Hoboken directory, no Raupuks listed. 7. Appearance in Document: WW1 Draft Registration, 6 May 1917, Bayonne, Hudson County, New Jersey, United States. 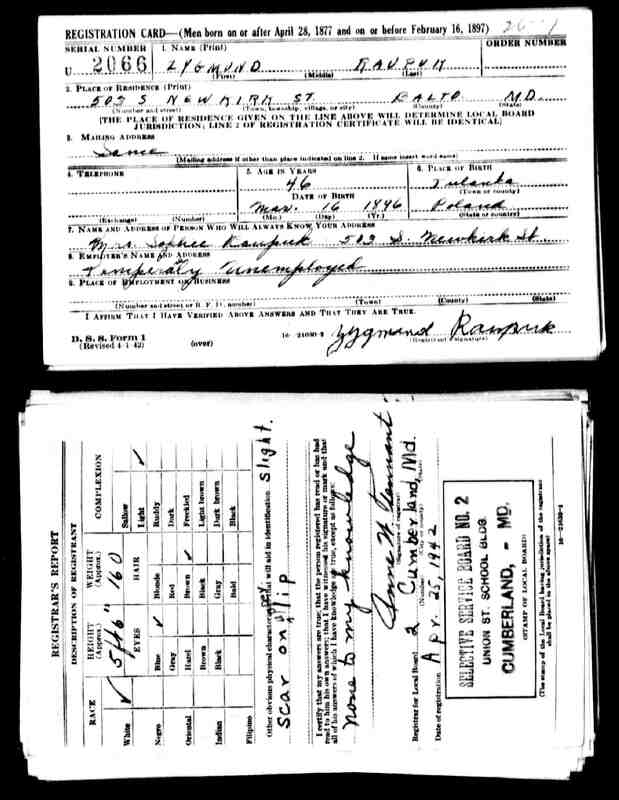 8541 Sigmund Raupuk is 21, address 101 Ave. E. Bayonne N.J., born 28 Mar 1896, Alien [not citizen], born "Russia Poland", citizen of Russia, laborer at Borax Company in Bayonne N.J., single, no dependents, caucasian, no military service, signature is "Zygmont Raupuk", tall, medium build, blond hair, brown eyes. Date of registration is "5/6/17" in 4th precinct of Bayonne, N.J.
8. Story, 1918. In 1918 Jersey City, Bayonne, & Hoboken directory, no Raupuks listed. 9. Residence, Dec 1918, Pennsylvania, United States. 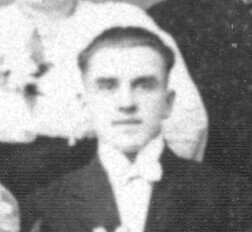 7868 Based on birthplace of son Leo, family should be in Pennsylvania in Dec 1918. 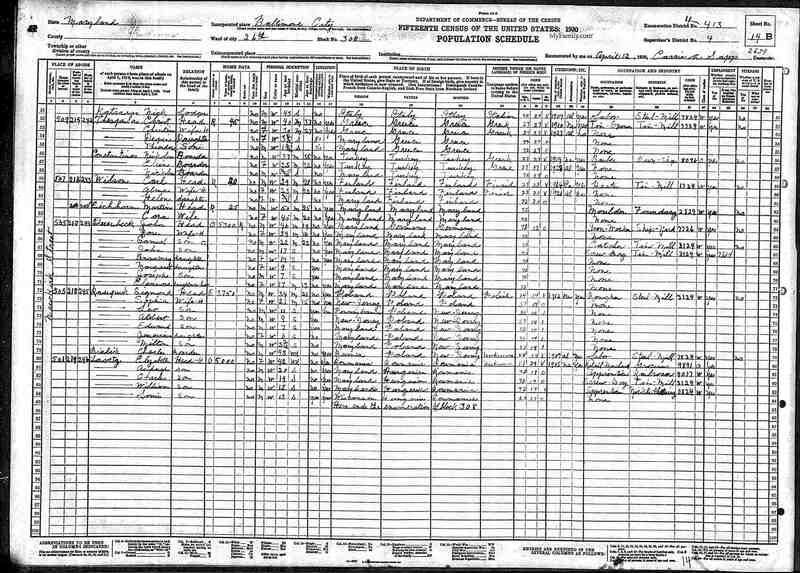 Nicholas and Annie are in Passaic in 1930 census also, both born Poland. 12. Residence, 1921, Bayonne, Hudson County, New Jersey, United States. Based on alleged birthplaces and birthdates of children, should be in Bayonne in 1921 and in Baltimore in 1922. 15. Appearance in Document: Newspaper, 26 Mar 1923, Baltimore, Maryland, United States. 8538 Mortgage: Zygmont Raupelk & wife to Canton Pulaski Polish B A, 1900. 17. Residence: 619 S 14th E, 1924, Baltimore, Maryland, United States. 8540 In 1924-5 Baltimore City directory, Raupuk Sigmond listed as tinworker, with wife Sophia, living at 619 S 14th E.
23. Appearance in Document: WW2 Draft Registration, 25 Apr 1942, Baltimore, Maryland, United States. 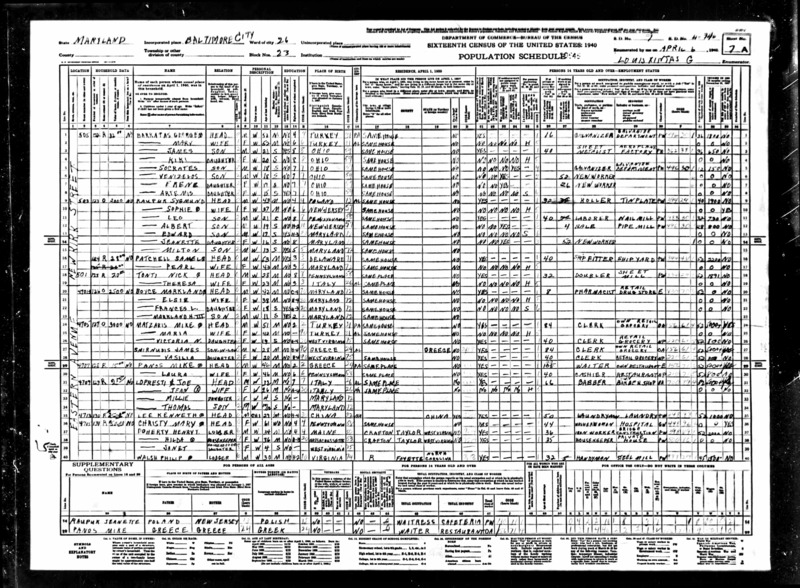 8536 Zygmond Raupuk resides at 503 S. Newkirk St., Baltimore, MD, age 46, born 16 Mar 1896 in Pulanka, Poland. Contact is Mrs. Sophie Raupuk of same address. Employer says "Temporarily Unemployed." Height 5 ft 6, weight 160, light complexion, blue eyes, brown hair, slight scar on upper lip. Registration card is stamped by registrar in Cumberland, MD. 24. Story: Pulanka. There are several candidates for the location Pulanka, which was listed at Zygmund's birthplace on his WW2 Draft Registration. There is a village called Polanka in south-west Poland, in Lower Silesian Province of today's Poland. There is a village called Polanka in south Poland, in Lesser Poland Province of today's Poland. There is another village in the same province called Polanka Wielka. There is a village called Polanka in east-central Poland, in Masovian Province of today's Poland. There is a village of Polanka in today's southeastern Latvia, very near the border with Russia and Belarus. 27. Story: Galicia. The wikipedia entry for Galicia says "Beginning in the 1880s, a mass emigration of the Galician peasantry occurred. The emigration started as a seasonal one to Imperial Germany (newly unified and economically dynamic) and then later became a Trans-Atlantic one with large-scale emigration to the United States, Brazil, and Canada . Caused by the backward economic condition of Galicia where rural poverty was widespread (see Economy below), the emigration began in the western, Polish populated part of Galicia and quickly shifted east to the Ukrainian inhabited parts. Poles, Ukrainians, Jews, and Germans all participated in this mass movement of countryfolk and villagers. Poles migrated principally to New England and the midwestern states of the United States, but also to Brazil and elsewhere; Ukrainians migrated to Brazil, Canada, and the United States, with a very intense emigration from Southern Podolia to Western Canada; and Jews emigrated both directly to the New World and also indirectly via other parts of Austria-Hungary. A total of several hundred thousand people were involved in this Great Economic Emigration which grew steadily more intense until the outbreak of the First World War in 1914. The war put a temporary halt to the emigration which never again reached the same proportions. 29. Story. Ed says all children were born at home, none at hospitals. 30. Story. Owned a bar in East Baltimore for a while, in Highlandtown off of Eastern Ave. Had it for about 5 years. 31. Immigration. There are no Raupuk records in the Philadelphia or Boston immigration records. 1. 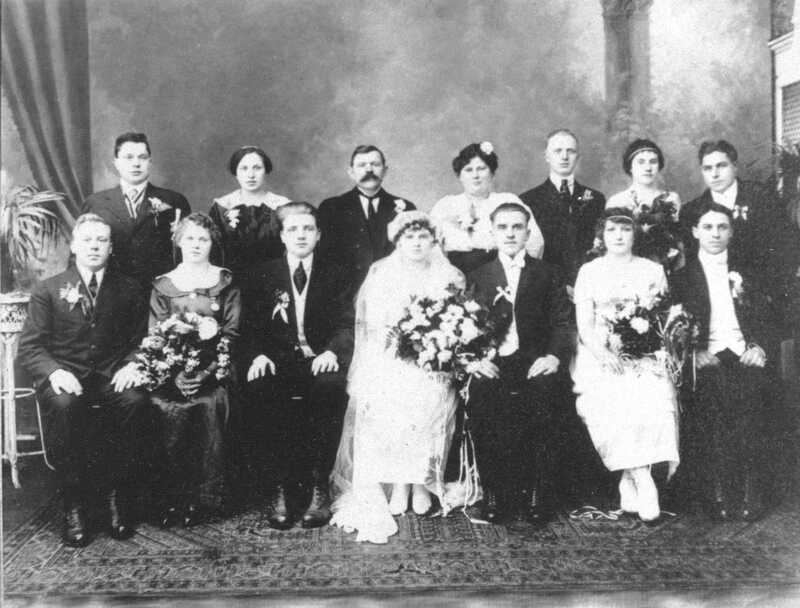 Story: Wedding Photo, Cir 1918. Ed Raupuk does not know who any of the people in the photo are, except that Sophie's parents are standing behind her (middle of back row). The photo was taken by a photographer in Baltimore, so did the wedding really happen in Baltimore or in New Jersey?